Another coffee shop. 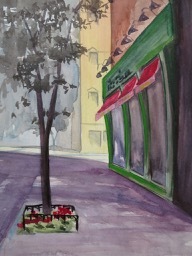 This one is on 2nd Ave, a street down which I often walked while searching for a good place to paint. Sometimes, I would go in. The facade with it’s arching window dividers and row of exterior lights attracted me. I settle down on the shady side of the building one morning and painted this. The shade, awnings and sidewalk tree gave the place a kind of attractive sense of shelter.